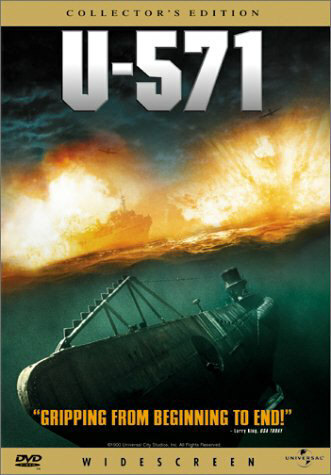 If you are a fan of the war movie sub-genre U-Boot and submarine movies then you might consider watching U-571. It’s not great, it’s not innovative, it’s corny at times but it’s decent and gripping enough – despite an anti-climax towards the end – and offers two hours of entertainment. The cast is well-chosen (Bill Paxton, Matthew McConaughey, Harvey Keitel, Thomas Kretschmann, Jon Bon Jovi), the story is somewhat stretched in its plausibility but not totally far-fetched either. The American submarine U-571 is sent on a secret mission to capture the Enigma machine on a German submarine. They will achieve this by diguising the boat and the crew as German. While the initial part of the mission works out – they get on the boat – , they are not able to return to their own sub and have to stay on the German boat that has been damaged badly before. There are not many survivors of the German crew apart from the character played by Thomas Kretschmann. Kretschmann is one of those actors who will always be casted in a newer war movie in which there is need for a cool-looking, blond German. He is the prototypical Aryan-looking German soldier, so to speak. I’m generally very fond of him but this isn’t his best role. Of course all kinds of other submarines will start to chase the U-571 while the boat gets more and more damaged. All the cliché elements of the subgenre are present, waiting for being hit, diving too deep, water leaking in. Now the truth is that there were far more British missions of this kind during WWII than American ones and the episode shown in the movie is purely fictional. Fact is that Germany sunk far over 1000 Allied ships in 1941 and almost achieved a total blockade of Great Britain. The same year a British crew managed to board a German U-Boot and captured the so-called Enigma machine. The Enigma machine (more of it can be seen in the movie Enigma) was a machine that encrypted messages between the German U-Boots and their high command. Capturing the machine led to a significant breakthrough in decoding messages. But all this is history and little of it can be seen in this movie. All in all this is a movie for fans of the subgenre and of some of the actors and is decidely more of an action than a war movie. I think Das Boot made every, but absolutely every submarine/U-Boot movie redundant. What’s there to say after a final statement? What is there to add to perfection? Das Boot is one of the best war movies and one of the best movies in general and THE best U-Boot movie there is. Why watch and review any others? Because there was a time before Das Boot. And submarines are not U-Boots, guess you get my drift. We Dive at Dawn came out during the war so it is not surprising that it is propagandist. The movie starts aboard the British submarine HMS Sea Tiger just before the crew swarms out on a seven-day leave that is aborted after just a few hours. They are sent on a secret mission after the German battleship Brandenburg heading for the Baltic sea. When finally encountering the battleship they are heavily attacked by the destroyers who flank the Brandenburg. We have the familiar elements like crash diving, torpedoing and being depth-charged. They seem to lose the fight and only a very shrewd trick helps them to escape. However they have no clue if their mission is accomplished and when diving up again realise that they have run out of fuel. What to do next? One of the crew suggests to land in Denmark and try to refuel there. Of course that is occupied territory and we get to see some fighting on land. Whereas the American war film will often feature an ethnic and regional smorgasbord of characters, the british version involves Cockneys, Scots and Yorkshiremen like Eric Portman’s hydrophone operator, Hobson, whose marital difficulties are making him a surly chap. John Mills who is in an incredible number of British war movies of the time stars as the captain of the Sea Tiger (e.g.Ice Cold in Alex, The Colditz Story (so far one of my favourite POWs), Above us the Waves, Dunkirk). He is a good actor. No doubt about that. All in all this is a decent movie. Interesting characters and side stories, gripping combat (not that land bit, that is so so). We Dive at Dawn is a black and white movie which enhances the atmosphere. I haven’t seen all that many submarine movies. Once I have had a chance to watch and review a few more I will be able to give a decent evaluation. For the time being, should you only watch one sub movie in your lifetime, then stick to Das Boot but if you like the genre, don’t miss We Dive at Dawn. I couldn’t find a trailer but added an excerpt instead.